Dr. Khera: Thank you for the introduction. I appreciate it. As you mentioned, there have been significant controversies with the use of testosterone therapy over the past five years. Cardiovascular risk, DVT, prostate cancer, BPH, and today I’d like to discuss some of those controversies and give you some further insight into the diagnosis and treatment of hypogonadism. Dr. Khera: I always like to give you some of the statistics. I’m not sure if many of you know this, or are aware that in 2012 testosterone was one of the fastest growing medications in the United States. There wasn’t a single medication that was selling faster than testosterone. The concern that while the testosterone sales were increasing, the testing in the United States during this time was also starting to decline. 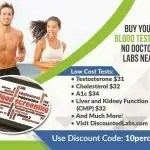 One interesting statistic was that roughly 27 percent of men who initiated testosterone did not have a blood test before taking the medication, and 21 percent of men who started testosterone didn’t have a follow-up test. So clearly there was some abuse with testosterone and some concerns. Dr. Khera: When I talk about controversies today I’d like to give you three different perspectives. I want to give you the perspective of what the FDA label has to say, as well as what the guidelines have to say. We were very fortunate in 2018; two guidelines came out. 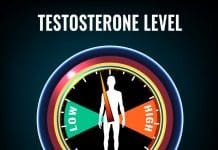 The AUA, the American Urological Association, came out with their testosterone guidelines the same time the endocrine guidelines also came out with their testosterone guidelines, as well. So I’d like to share with you these three different perspectives as we go forward. Dr. Khera: The first is on the concept of venous thrombosis embolism or VTE, and so you should be aware that in the package insert of a testosterone products in 2005 in the adverse reactions section of the label, it was appended to note that one patient during the open-label extension trial did suffer from the DVT. Now in 2009, the label was changed again under the new medication guide that lists blood clots in the legs among the serious side effects. If you open the package insert for testosterone products, you will see, and this is just for Androgel, that they do put in the section warnings and precaution a concern for VTE. I’ll read this. There have been postmarketing reports of VTE events including DVT, PE in patients using testosterone products, Androgel in this case. Evaluate patients who report symptoms of pain, edema, warmth, and erythema in the lower extremity for DVT and those who present with acute shortness of breath for PE. If a VTE is suspected, discontinue treatment with testosterone and initiate appropriate workup and management. Dr. Khera: So this is in the package insert, and you should be aware that patients will read this and they will ask you about this. 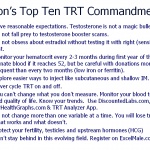 We should be very careful because the guidelines slightly differ, and if you look at the American Urologic Association guidelines, it states that patients should be informed that there is no definitive evidence linking testosterone therapy to a higher instance of VTE. The entering guidelines don’t have a guidelines statement on this, but they do have some comments that they’ve made. They do state that case-control and pharmacoepidemiological studies have not shown a consistent increase in the risk of VTE with testosterone treatment. However, there is two huge testosterone associated VTE events in randomized controlled trials to draw meaningful imprints. 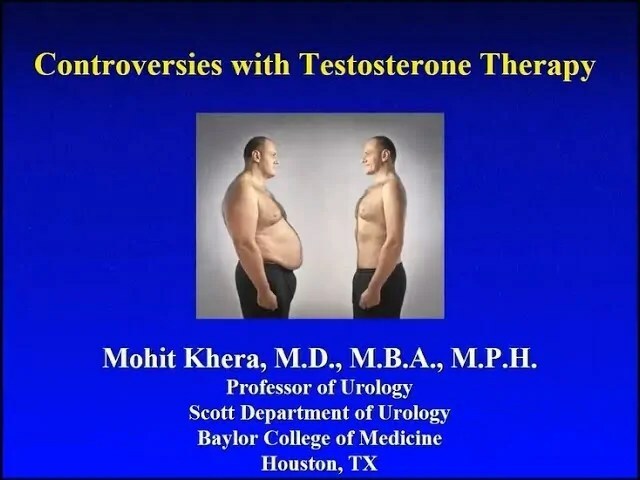 Dr. Khera: So you can see where there are three different perspectives here, and they all are slightly different in their beliefs in how testosterone affects VTE. Dr. Khera: The second controversy is cardiovascular risk. Many of you may be aware of this. There was a significant amount of concern at one point that testosterone may cause a heart attack. So I’ll put this in the context of a story. It was very interesting, Molly Shores in 2006 published a very nice study looking at men at the VA and what she found was that those men with lower testosterone levels were much more likely to suffer from earlier death. They died earlier or sooner than men with normal testosterone levels. If you look at the studies following the Molly Shore study, they were prospective studies, larger studies, all finding the same thing. Those men with lower testosterone levels tended to have increased mortality, and if you look at the right-hand column, the cause of death seemed to be cardiovascular death in many of these studies. Dr. Khera: Before 2010 there were also many studies suggesting that giving testosterone may decrease the risk factors for cardiovascular events. 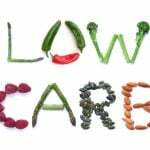 Risk factors meaning obesity, metabolic syndrome, diabetes, cholesterol, and they may have some beneficial effect in decreasing the risk factors of cardiovascular disease. Dr. Khera: We conducted our review and looked at every single article we could find from 1940 to 2014. We found over 200 articles addressing testosterone and cardiovascular disease. The majority of these studies being favorable against suggesting low testosterone is a risk factor of cardiovascular events, and we could only find four studies suggesting that testosterone may increase cardiovascular risk. Now, these are the four studies; I don’t have the time to go into each one of these in detail. The majority of these studies are not randomized or placebo-controlled, and the Finkel study did not even have a control group. But suffice to say that these studies did bring up some concern that testosterone may have an increased risk for cardiovascular events. Dr. Khera: Based on these studies, the FDA did put in the package insert, and you should be aware, that to date epidemiologic studies in randomized controlled trials have been inconclusive in determining the risk of major adverse cardiovascular events and patients should be informed of this possible risk when deciding whether to use or to continue the use of Androgel one percent. So this is in the package insert. Dr. Khera: The EMA which is the equivalent of the FDA did look at this data and have not made any changes to their cardiovascular warnings of their products. The guidelines are a little different. 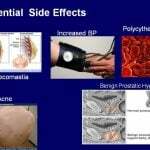 I will tell you that in 2018 we also published another study looking at all the studies from the FDA warning in 2015 to the current date, and we found 23 studies also looking at testosterone and cardiovascular disease, and again we couldn’t find any studies suggesting that testosterone increases the risk of cardiovascular events. We found studies suggesting that men who normalize their testosterone with testosterone therapy had a reduced risk of MI and death compared to those men whose testosterone failed to normalize. Dr. Khera: The AUA and endocrine guidelines do have statements on this, and the first statement by the AUA guidelines is very clear. Clinicians should inform testosterone deficient patients that low testosterone is a risk factor for cardiovascular disease. That’s important. Low testosterone is a risk factor for cardiovascular disease. 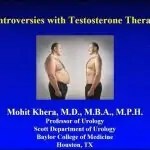 Now, they go on to say, “Before initiating testosterone treatment clinicians should counsel patients and this time it cannot be stated definitively whether testosterone therapy increases or decreases the risk of cardiovascular events.” If a patient does have a cardiovascular event, the AUA guidelines suggest that we wait at least three to six months before starting therapy again. The endocrine guidelines are a little different. The editing guidelines recommend that we wait six months, not three to six months, but six months if a patient suffers from an MI we should wait at least six months. But the endocrine guidelines also agree there’s no conclusive evidence to support that testosterone supplementation is associated with an increased cardiovascular risk in hypogonadal men. Dr. Khera: Those mechanisms, just so you know, is several, there are four theories, but the most common theory is the belief that the elevated red blood cell count, also known as erythrocytosis, could then lead to thrombosis, atherogenesis, and increased cardiovascular risk. That is the most common theory. We spent quite a bit of time studying this; this is a study that we published looking at patients. Remember that the injectables have the highest rate of erythrocytosis. In our study it was 66 percent, in other studies, it’s about 40 percent. So if a patient starts developing an elevated red blood cell count, one of the quickest things you can do is get them off the injectable, put them on a gel. A gel typically has an erythrocytosis rate anywhere from two; I’ve seen as high as 13, 14 percent. It’s a lower rate. Because there’s less of a spike that occurs with the gels. The injectables cause a spike which increases erythrocytosis rate. Dr. Khera: Now that erythrocytosis typically doesn’t occur until about three to six months, so there’s no point in checking blood in two or three weeks. You have to give it some time. And the number you wanna remember is 54. The guidelines typically state that at 54 you want to either have the patient phlebotomize, which is donate blood, or you wanna decrease the dosage, but we don’t want it to get above 54. Nelson Vergel: Doctor Khera, one question here. Nelson Vergel: Has anybody actually published data on hematocrit versus DVT risk? Dr. Khera: So two points. One, there has never been a testosterone trial, a testosterone trial showing that the elevation in the cardiovascular risk on the testosterone trial was the cause of a DVT. There’s been anecdotal data on patients taking testosterone and getting a DVT. 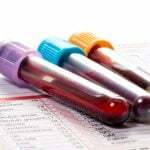 But there’s not been a trial showing that the testosterone which caused an elevation of hematocrit that led to a DVT. Majority of the data that comes from an elevation in causing a DVT is from Polycythemia Vera data. This is a malignancy of bone marrow. There have been several studies showing that an elevation in hematocrit in this population may lead to an increase in DVT. Some studies were inconclusive; some studies did suggest that yes, in this population an elevation of hematocrit did lead to a DVT. But we should be clear that this population is very different from the general population, right, and so it’s using a transference. You’re just insinuating that this population and this data can be used in the general population. Dr. Khera: So again, I think you should be very careful. We need a trial. 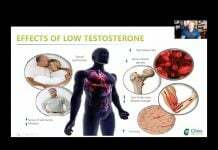 More information: Low Testosterone: How Low is Too Low?